The 153 room Ein Gedi Kibbutz Resort Hotel is located in one of the most scenic areas in the world, on the edge of the Judean Desert, overlooking the mineral-rich Dead Sea and Moab Mountains. 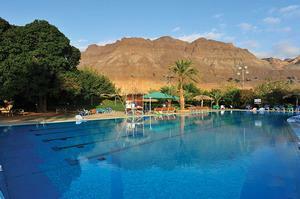 Ein Gedi Country offers a variety of safari routes in the wild, remote interior of the Judean Hills. *rate for HB supplement applies only when reserving HB in advance. Please pay attention:a maximum of 3 adults or 2 adults + 2 children can stay in mini suite, arugot - deluxe room, desert renovated standard rooms. 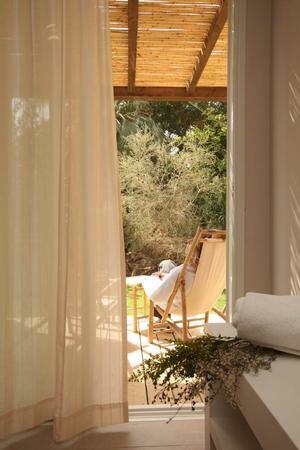 The guesthouse has 120 comfortable rooms set in the botanical gardens and green lawns of the kibbutz. Guests can choose full or half board, with an excellent kosher menu. 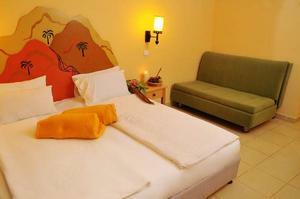 Rooms are air-conditioned and have a telephone, cable television and facilities to make coffee. The guesthouse offers guests a wide range of activities, which include sports facilities and some pampering - a covered swimming pool, heated in the winter; an open pool for the summer months; tennis courts; mini-golf, football; basketball; and a gift shop. From Tel Aviv via Jerusalem to the dead sea, then 40 km. on road no. 90 direction south till kibbutz Ein Gedi. From the south via Arad to the Dead Sea, then 35 km. on road no. 90 direction north. The hotel is located in the Kibbutz.